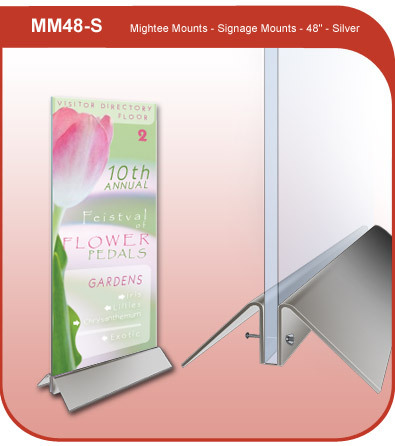 Directory Signage Mounts - 36"
The Mightee Mounts Directory Signage Base - 36" are great for displaying single or double sided graphics up to 36 inches wide. Held together with carriage bolts and wing nuts the signage mounts can hold up any sign board that can support it's own weight. The mounts weight being centered at the floor makes this a sturdy and modern signage stand. The model MM36-S is a steal base that forms a rigid M shape that can hold substrate up to 1" thick.